Tech and rest: Samsung galaxy pocket duos is available for pre-booking online. 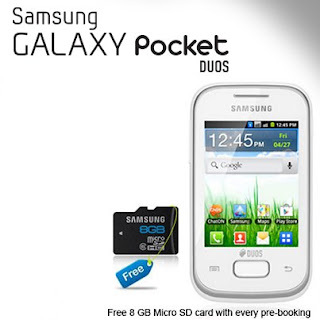 Samsung galaxy pocket duos is available for pre-booking online. Samsung has launched Galaxy Pocket DUOS. It is a dual sim dual active phone loaded with android 2.3. There are some good things about this phone. It is dual active that means if your on call on one SIM, the other SIM can still receive calls. Internal memory of 4gb is present with expandable microSD card slot. Its camera feature panorama and smile shot mode and the battery is also good 1200 mAH.